Before I started running my computer business full time, I had a feeling that entrepreneurship would be far and above more stressful than working in my corporate IT job. I suspected that I’d be working long hours supporting my business and stressing out over making my customers happy. After all, as a business owner, all responsibility falls on ME for EVERYTHING, right? That sounds nerve-racking! In my corporate gig I only needed to worry about one small piece of a large business. Sure, I could show some initiative and go outside my box now and again, but mostly I just did what my boss said. More importantly, if the business got sued, if equipment failed, if employees quit, or the company went bankrupt, it really wasn’t my concern. At the end of the day I’d just leave it all behind, go home, and watch The Office. 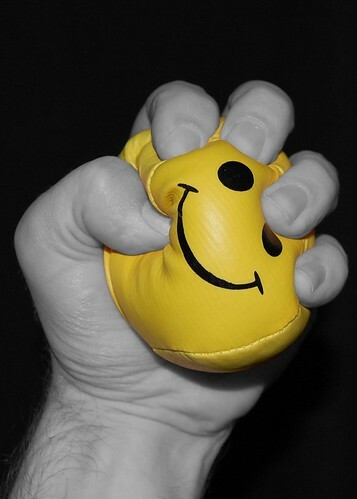 While I do sometimes work long hours, sometimes have problem customers, and cashflow is still fairly unpredictable…I’m very rarely stressed out. In fact, after running my solo consulting business for over a year and a half now, I’ve come to the realization that I’m FAR MORE happy and relaxed in this new role. I can take all the above reasons why I feel as though running my own computer business is less stressful than my previous corporate day job and boil them down to one word. That word? It’s simply the feeling of control I have over every aspect of my professional life that seems to create a peace of mind I never experienced in my “day job”. Don’t get me wrong, it hasn’t been a cake walk. The money has been tight and it takes a lot of work, dedication, and patience to grow a business. But the fact that it’s all under my control is strangely liberating. There have been times I’ve had to stop working for certain customers because they don’t pay on time or they didn’t mesh well with my personality. Instead of stressing out and fighting to keep problem customers, move on and replaced them with a customer that you enjoy doing business with. This is probably the single biggest tactic that keeps my hair from graying prematurely. Are you a hardware wiz? Do you love networking and running cables? Are you more comfortable designing websites? Whatever you love to do, strive to do that most in your business. It can be hard, especially at first, to find work in your selected niche. But continue to advertise the work you do best so that eventually that’s all you’ll be doing, and you’ll be happier for it. In the spring and summer, on the days that I don’t have onsite client work to do, I love taking a walk down to the local coffee shop to do work on my laptop. I’m a musician, so on days when I have a gig in the evening, I wont schedule clients that afternoon. This is all flexibility I enjoy from being self employed that I rarely found in the corporate environment. You are in charge of your schedule, so make sure to take advantage of this flexibility and make it work for your life. Try not to let your clients dictate your schedule (within reason, there are emergencies from time to time). Make sure to take time for yourself and your family. We must learn, as a certain superhero learned, that with great power comes great responsibility. As an independent consultant we have ultimate control over our destiny, which means we can easily sabotage it with poor decisions or just plain laziness. But I’ll take freedom of choice over toeing the corporate line any day of the week. If you feel the same way, make sure you’re using every opportunity to make your business as fulfilling and stress free as possible. What steps do you take to make your computer consulting less stressful? I agree with alot of what you wrote. But to state you have boss and and your not worried about getting fired… Think about how that looks. Customers are your bosses, if you think they won’t fire you they will. Good point Robert, customers are kind of like your boss when you’re a computer business owner. I think the main differences are that at a job, you can’t choose your boss, and when you get fired, that’s it, you’re done. As an independent consultant, on the other hand, you have the freedom to choose the kind of customer you want to work with. And if a customer “fires” you, it’s not the end of the world. If you’re a good consultant you’ll have plenty of other customers to take their place. On point as always Matthew. When I became self employed some 4 odd years ago and counting, I guess I technically swapped out one boss for 1000 of them! Though as you’ve stated, at least if it doesn’t work out with one, you can easily dust off and move on to the next. I too love the fresh Spring/Summer days sitting out the back of the house and remotely administrating a client server or workstation whilst enjoying the weather. Best of both worlds! It’s not a bad gig we’ve got ourselves.